Do you think the words “warm” and “salad” work together? Well, they can if you use lentils. I love the idea of a warm lentil salad because it is cold outside and a REAL salad is a turn off. All I can think about is cheese, potatoes, and beer. You do not have to soak them. They take only 20 minutes to cook. Canada grows the most lentils in the world. I know this because I went on a trip to meet Canadian lentil farmers in July. I gotta tell you, if you want to hang out with some super nice people, choose Canadian lentil farmers. Also they have a great website with many yummy lentil recipes: Canadian Lentils. They gave me a bag of Beluga lentils, which I cannot find in stores near me which makes me sad. They have a great flavor and consistency and I did find them on Amazon.com (see below). You don’t need Beluga lentils to make this recipe work. Just buy a bag of green lentils usually found next to the other dried beans in your grocery store. Look at all that fiber and protein! Wow! And lentils are inexpensive. A one pound bag cost me a mere 79 cents. I used center cut bacon to flavor the lentils. Center cut has less fat than regular bacon and I think it tastes the same. The bacon also provides a satisfying crunch. This salad will take you 20 minutes to make. You start your lentils and then work on the rest. By the time the lentils are finished cooking, you toss it all together for a warm healthy salad that will comfort you after a long day in the cold. 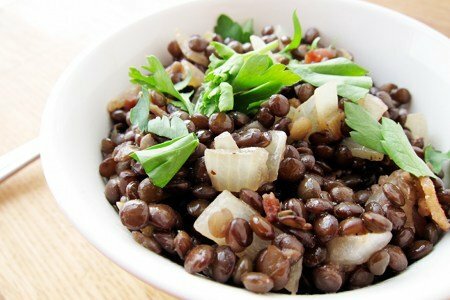 Have you made a warm lentil salad? Please share. You inspired me! I have lentils already cooked in the fridge that I picked up from Trader Joe's and I have red lentils and i have never used either. I think I am going to make them tonight! Awesome recipe!! Love lentils. Always keep the Trader Joe's already cooked in stock to put in a cold salad or add to soup,burgers, chili, etc. Going to try this warm salad. Thanks for all your great recipes Lisa. Thanks for the post. Since I am a college student with limited cooking methods, do you know of a way to cook lentils in the microwave? I'm a new vegetarian and have been experimenting with things I would have never dreamed of to see what I like and dislike. I made lentils for the first time this weekend and they were so easy (no soaking, like black beans, which I love). I made a mujadarrah inspired dish of lentils, brown rice and onions. Top with a dallop of Fage and I'm good to go for lunch all week! YUM! Can't wait for lunch! Maybe I should have had a savory breakfast today! Looks yummy. I love the idea of the bacon. I never thought of a warm salad before - this one is going on the menu! Nice! I see a lot of for veggies to join this base salad-- beets, greens... thanks for getting me started! Happy New Year! I'm with Kristi-- any way to cook them in a microwave? "Oooooo" Is what I said, looking at this ( Actually, it was more of a " Wannnntt!" ) I am SO burnt out on lettuce and spinach salads! This looks hearty and filling. I'm right there with ya on wanting cheese, potatoes and Beer! Canada the lentil capital? Who'd have thunk it? lol I learn so much from your site. I'm always looking for new ways to use lentils and any dried legume for that matter. I just enjoyed reading your chocolate cake recipe with lentils... It all looks so good to me and I bet I could even get my 10 year old to eat this cake without hearing a peep about lentils. The salad idea is neat, but I have to wrap my head around it! I stir it up and and then slow-cook this stuff for 4-5 hours. I suspect such a long time isn't truly needed, but I like the flavors to meld. Again, stir, and slow-cook for a few hours. I found a microwave recipe which I will post below. It seems easier to cook lentils on the stove - but I think you college students don't have a stove? Lentil Soup Preparation time: 25 minutes Cooking time: 33 minutes 4 ribs celery, peeled and cut into small dice (about 1 cup) 3 medium carrots (about 4 ounces each), peeled and cut into small dice (about 1 cup) 4 ounces yellow onion, peeled and cut into small dice (about 1/2 cup) 3 cloves garlic, smashed, peeled and minced 1 tablespoon vegetable oil 2 teaspoons ground cumin 1 teaspoon chili powder 3 cups chicken broth 3 cups water 1 cup dry brown lentils 1/2 cup chopped parsley Freshly ground black pepper. 2 teaspoons fresh lemon juice. 1.Stir together celery, carrots, onion, garlic, oil, cumin and chili powder in a 5-quart casserole with a tight-fitting lid. Cook, uncovered, at 100 percent power in a 650- to 700-watt oven for 3 minutes. 2.Remove from oven and stir in chicken broth, water and lentils. Cover with lid and cook at 100 percent power for 30 minutes. 3.Remove from oven and uncover. With a slotted spoon, remove about half of the lentils and vegetables to the work bowl of a food processor. Puree until smooth. Stir puree back into casserole with parsley, black pepper and lemon juice. @Barb L - It really is good. And (depending on how much you add, of course), I find that it's got that nice, slow burn that makes it a perfect winter dish. The nearest Whole Foods is about 40 minutes from us, too, so it tends to be a weekly (or less frequent) trip. I've found that some of the (smaller?) WF stores don't carry the Frontier Berebere seasoning. I've had to look carefully, as it's usually clumped with a handful of other "Ethnic" spices in its own little section (still in the spice aisle). For what it's worth, the bottle is around $5 and I think if you like/don't like some of the ingredients therein, it would be trivial to create your own version of berebere, probably for a lot less money. Andy-yeah I often create my own spice blends from bulk spices that are so superior tasting and cheap! Actually, I DO have every single one of these in my cabinet now, great, another fun thing to do today! [l usu add br rice to bean dishes too for the complete protein and lately have learned how to use quinoa, good stuff!] Thanks for your interesting comments! Question: For a vegetarian version, leaving out the bacon, would it change the pointsplus? And, is there a condiment or way to add some flavor without bacon? @Barb L - thank you for the kind words. I just piggyback on Lisa's great ideas. To wit, her "...during grad school (when I got smarter), I would always have a can of black beans, fresh salsa, and grated cheese" comment (from http://www.snack-girl.com/snack/college-healthy-snacks/) has stuck with me for nearly two years. Having some basic ingredients ready to grab from the fridge is probably the best foundation I can think of for eating healthy. Organic Paprika, Sea Salt, Organic Cayenne, Organic Fenugreek, Organic Coriander, Organic Cumin, Organic Black Pepper, Organic Cardamom, Organic Cinnamon, Organic Clove, Organic Ginger, Organic Turmeric. Great idea. Healthy and so so delicious. I made this for lunch today, using plain,ol' green lentils. Delicious! After tasting it, I felt it was missing 'something'. Added a splash more vinegar and it took on a German Potato Salad feel. Perfect!